There is a single specimen of Cicindela cursitans in the UMC collection, it was collected in “nr. Portageville” on July 7, 1991. We have tried several times without success to locate this species in Missouri – it’s the only species that we have not relocated. If you have any interest in looking for it that would be great. Attached is a pdf of recent paper describing its habits and biology in Nebraska. Fig. 2. Adult female Cylindera cursitans ovipositing in moist sand/loam substrate. Little did I know how catalytic that comment would be – the very next day I received an email from Kent not only stating that he found it, but that he found it at the “end of the hiway” spot where we thought it might be. A digital photo confirmed its identity, and the that weekend I blasted down to meet Kent and see the beetle for myself. I would see just two beetles that day, but both were at a new locality about one mile south of where Kent had originally spotted them. Kent would later find them at yet another locality further north along the Mississippi River, and in 2008 the three of us (Kent, Chris, and myself) conducted an intensive survey of potential habitats in southeastern Missouri that identified additional populations both north and south of the original localities. We concluded that populations of C. cursitans, were restricted in southeast Missouri to the ribbons of wet bottomland forest that occupy the narrow corridor between the Mississippi River and the levees that confine it. However, the populations appeared secure and likely did not require any immediate conservation measures to ensure their long-term survival within the state. Fig. 3. Adult male Cylindera cursitans. The bottomland forests that harbor C. cursitans in southeast Missouri (Fig. 3) contrast sharply with the wet meadow habitats reported for populations in Nebraska (Brust et al. 2005a). Within these habitats, the beetles themselves are very easily overlooked because of their small size and rapid running capabilities. In addition, adult activity peaks in June and begin to wane in July. The combination of these factors explains our initial difficulty in finding the beetle; however, with a proper search image and better understanding of its temporal occurrence and habitat preference, we have since found the beetles to be rather easily located. A lingering question from last year’s survey is, how far north along the Mississippi River does C. cursitans occur? Furthermore, might the species also occur in northeast Missouri due to its proximity to the Nebraska populations? Most of Missouri straddles a curious distributional gap that separates the bottomland forest dwelling populations in the southeast from the wet meadow dwelling populations in the upper Great Plains (Hoback and Riggins 2001). This has led some authors to suggest that the observed distribution represents two disjunct forms and potentially two species (Ron Huber, pers. comm.). Additional surveys of potential habitat further north along the Mississippi River and in northwest Missouri along the Missouri River could prove useful in confirming or refuting that suggestion. Fig. 4. Habitat for Cylindera cursitans, along Mississippi River, vic. Donaldson Point Conservation Area, New Madrid Co., Missouri. While such surveys were not possible this year, long-time fieldmate Rich Thoma and I were able to visit the Southeastern Lowlands in June to examine a few habitats along the Mississippi River found a little further north of the northernmost extent of our 2008 survey area. We succeeded in finding another population at one of these sites near the northern limit of the Southeastern Lowlands. The individuals shown here (Figs. 1-3) were collected from that location (extreme northeastern Mississippi Co.), confined on local sand/loam substrate, and photographed a few days later. In one of the photos (Fig. 2), a female can be seen in the act of ovipositing into a hole dug into the substrate with her ovipositor. The more observant readers might notice a strong resemblance between this species and another species to which I have devoted several posts, Cylindera celeripes (Swift Tiger Beetle). These two species are, in fact, quite closely related and can be distinguished by characters of the elytra (posterior portion not or only slightly expanded and lateral white maculations complete in cursitans, distinctly expanded and maculations reduced in celeripes) (Pearson et al. 2006), habitat (cursitans in moist lowland sites, celeripes in dry upland sites), and distribution (southeast Nebraska/southwest Iowa is the only area where the distributions of these two species overlap, although C. celeripes has not been seen in Nebraska for nearly 100 years! (Brust et al. 2005b)). Figs. 1-3: Canon 100mm macro lens with Kenco extension tubes (68mm) on Canon EOS 50D (manual mode), ISO-100, 1/250 sec, f/18, MT-24EX flash 1/2 power through diffuser caps. Fig. 4: Panasonic DMC-FX3 (landscape mode), ISO-100, 1/25 sec, f/2.8, natural light. Brust, M., W. Hoback and C. B. Knisley. 2005a. 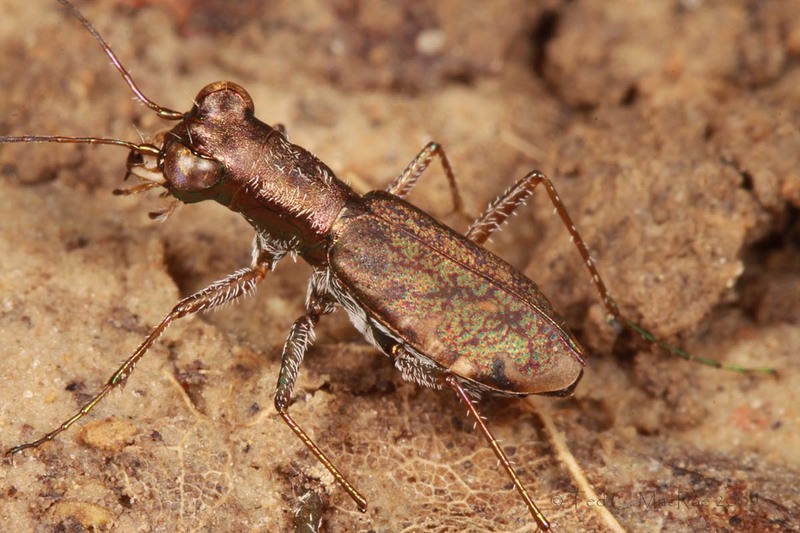 Biology, habitat preference, and larval description of Cicindela cursitans LeConte (Coleoptera: Carabidae: Cicindelinae). The Coleopterists Bulletin 59(3):379-390. Brust, M. L., S. M. Spomer and W. W. Hoback. 2005b. Tiger Beetles of Nebraska. University of Nebraska at Kearney. http://www.unk.edu (Version 5APR2005). Hoback, W. W. and J. L. Riggins. 2001. 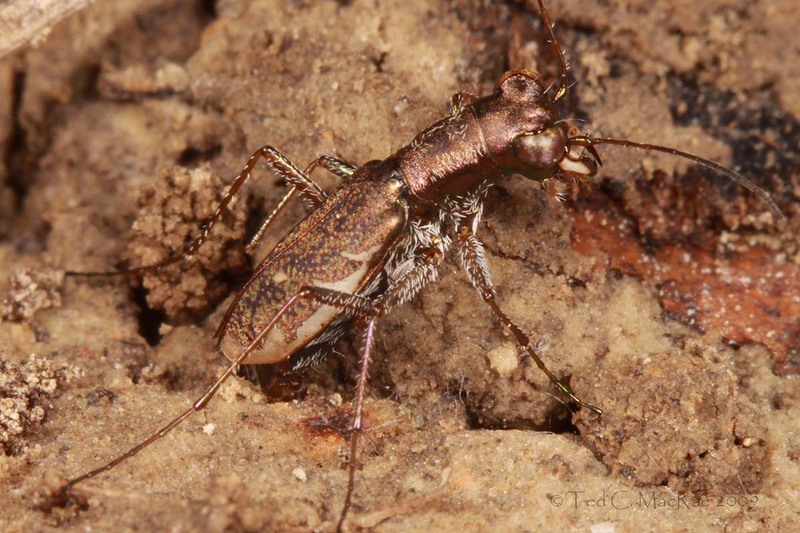 Tiger beetles of the United States. Jamestown, ND: Northern Prairie Wildlife Research Center Online. http://www.npwrc.usgs.gov/resource/distr/insects/tigb/index.htm (Version 12DEC2003). MacRae, T. C., and C. R. Brown. 2001. Missouri Tigers. Missouri Conservationist 62(6):14–19. This entry was posted in Cicindelidae, Coleoptera and tagged beetles, conservation, entomologists, entomology, forest, insects, Missouri, nature, science, taxonomy, tiger beetles. Bookmark the permalink. Fascinating article, I would love to search around NWMO for this interesting little tiger. Any suggestion where to look? We have several rivers, Missouri being the obvious choice, but also Nodaway, Platte and 102. 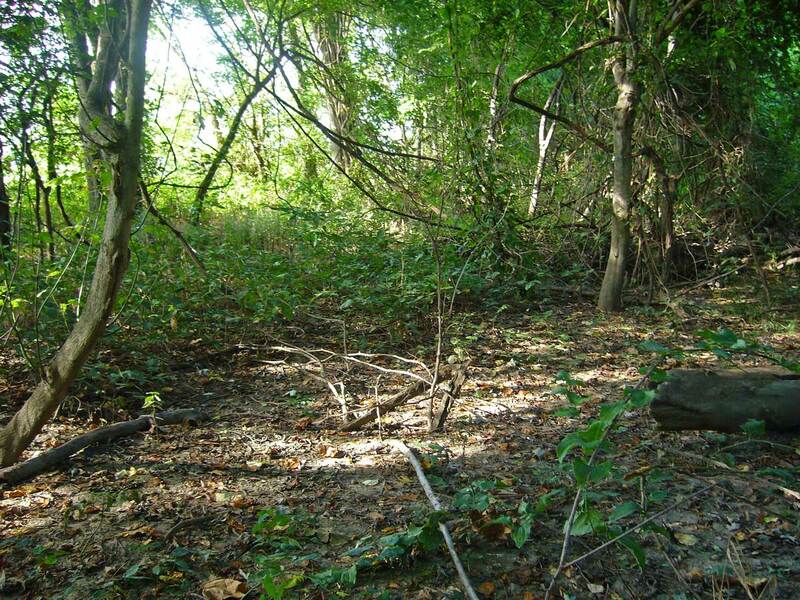 I would definitely try the Missouri River banks – find wet bottomland forest (canopy of cottonwood and/or silver maple) with relatively open understory (in southeast MO poison ivy and trumpet creeper are the dominant plants) on sandy/loam soils. We’ve found the beetles on slightly higher (and thus relatively drier) ridges and not so much on the moister swales in between (the river access at Thurneau Conservation Area strikes me as a good place to look). At least, that is the habitat in southeast Missouri – if populations are present in northwest Missouri they may prefer the open wet meadow habitats as found for the populations in Nebraska. Check out the Brust et al. (2005a) paper for details about these habitats. Good luck! There is a place along the 102 river at Happy Holler CA that looks very similar to the area you have pictured in the last photo. It has loamy soil under a open forested canopy. I will look for sites with the descriptions you gave and will also check out this site at Happy Holler, with any luck maybe some will show up there. I will do my best to photograph the fast little buggers, no promises. It took me forever to photograph that bronzed tiger beetle picture I emailed you. I finally had to plant my booty in the sand and sit and wait until one came within camera distance, then very slowly lean in for a picture and try not to scare it to pieces. Well, if you see it, be sure to collect a voucher specimen before trying to take photographs – the latter are nice, but from a scientific perspective the record is meaningless without the voucher. My standard approach is to catch the first one I see and keep it alive – that way I have both the voucher and a backup for photographs in confinement if I fail to accomplish that in the field. If you do get the chance to try field photographs, this species should be easier than C. repanda because it is flightless. 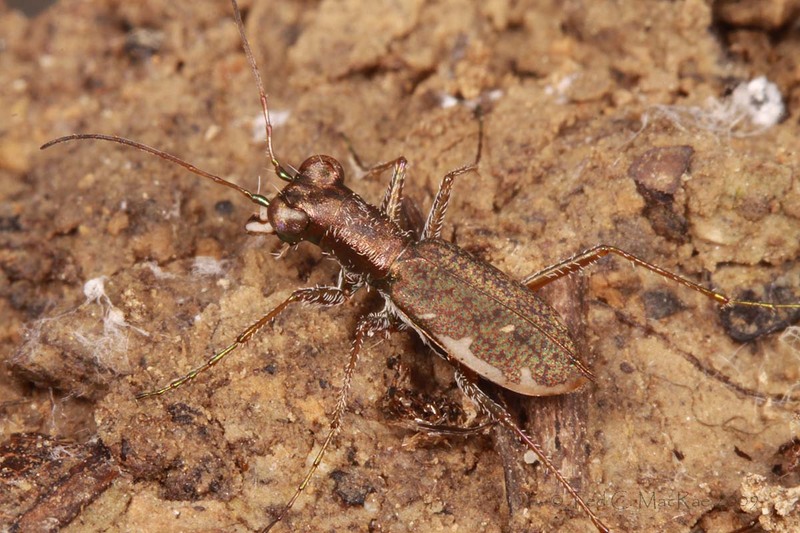 The difficulty with this species is seeing them and recognizing them as a tiger beetle to begin with (they are easily overlooked as just ants or spiders), but once you do recognize them you should be able to approach with relative ease (“relative” being a relative term :)). I’ve noticed that they tend to run for cover under foliage, but if you slowly and carefully lift the vegetation under which they are hiding, they don’t seem to realize that they are exposed and you can get off a few shots before they make another run for cover. I should probably write a post on my techniques for tiger beetle field photography. I will definitely capture one if I should happen to come across one, in fact if I am lucky enough to capture one I will mail it to you, after photographing it if you like. Yes, I think you should share with us how you manage to take such wonderful images of such traditionally difficult subjects like tiger beetles. Lets have it! Much of the secret to photographing insects is knowing their haunts and behavior. The ability to anticipate their reactions greatly increases your chances of a successful photograph. I hope you find C. cursitans in northwest Missouri. I’ll be up there again next June myself for additional C. celeripes surveys – the more eyes the better. Is there similar habitat on the far side of the river? Do you think that the species might be found in KY or TN in addition to MO? Any chance that it could get far enough north to be found in Illinois? Hi Doug – I have no doubt that it occurs on the other side of the river in Tennessee, Kentucky, and Illinois. I was quite tempted that day in June to stop and look for it on the other side (we actually crossed over at one point for a quicker way to get to another spot further north), but that was the day I also wanted to look for Typocerus deceptus at Trail of Tears SP. Good thing I did, as I got the shots! I believe the Great Plains form has also been found as far east as northern Illinois (presumably in the prairie peninsula). Bousquet, Y. and A. Larochelle. 1993. Catalogue of the Geadaphaga (Coleoptera: Trachypachidae, Rhysodidae, Carabidae, including Cicindelini) of America North of Mexico. Memoirs of the Entomological Society of Canada 167:1-397. Good article and yep i have been with Kent at 2 of the spots I think you have been to and found cursitans. They are very tricky to find. If it hadn’t been for Kents sharp eye we would have missed the specimen I got at the “end of the road” spot in August. Thanks, Cory. It’s amazing how much they look like little non-descript ants until you realize what they are. Kent tells me a guy down there has one from Cape Girardeau Co., so they even further north than what we’ve found. I wonder if they might even be up here near St. Louis! Hi Troy – thank you. It really is about the habitat – I’d been to that “end of the Hwy” spot several times, but never looked inside the forest rather than along the outer edges. Oh I totally forgot that Mike from Cape Girardeau had one. Yes I’ve seen it. He has some cool looking “Cicendella ubiquitous” as well. I think one is purple the other one is maybe green??? you’d have to ask Kent about that. I belive they are NOT USA species. He had another one from SE ASIA or S. America I think that had a neck like a Giraffe. Some really cool stuff. I haven’t paid too much attention to the ex-US species – too much on the plate as it is. I do have a nice little collection (2-3 hundred specimens) that I collected in Argentina – some different genera like Brasiella, Odontocheila, and Pentacomia but they still look pretty much like the US genera. I do have a real nice species I collected in Africa – Ophryodera rufomarginata, a nice, big, strikingly-marked species. Too many beetles, too little time! Great article, Ted. It was fun to re-live that experience. I was giddy as a kid at Christmas when the news first came through from Kent. Thanks once again, Kent!!!! Hi, Chris. Yes – all hail Kent! This was a good one, but I don’t think anything will match that feeling I had when we found C. celeripes at Brickyard Hill in northwest Missouri, and then finding E. macra that night at the blacklights. I love it when a plan comes together, but finding either one – much less both – was almost too much to ask for. As the poms would say – Jolly good show! Thank you, Trevor. This success was truly the result of teamwork and a little bit of luck. Great article. The serendipity of your “nr. Portageville” message seems rather satisfying. It would be neat* if this research helped answer the question about disjunct populations or separate species–or if it helped determine that perhaps there’s a subspecies identity hidden out there, one based on the population’s choice of habitat. Not that I have a clue about such things, but it’s nice to imagine from my pedestrian viewpoint. Thanks, Jason. One of the most satisfying things for me is when we find something where we think it should be based on a “hunch” – which is really just a nexus of past observation and experience. The C. celeripes story I relayed earlier this year is another exciting example of such – “neat” indeed! If nothing else, the discovery of these southeast Missouri populations gives us a good amount of material for comparison to the Great Plains material. If there are any morphological differences that can be correlated between the disjunct populations and their different habitat preferences, we’ll find them!